I originally gave up bread and refined sugar to lose weight. (Then I started reading…darn the internet!) Since this was (at least originally) primarily about weight loss (and then maintenance) for me, I keep a close eye on the scale. And I find I do best when I make vegetables the foundational element in my diet. Now this doesn’t mean eating salad all the time. But it does mean that I try to incorporate vegetables in all 3 meals a day. In doing so, I get more nutrition, and I find that my weight remains stable. But wait! you may be saying. Veggies for breakfast? Really? Yep. There are 2 primary ways I do it. 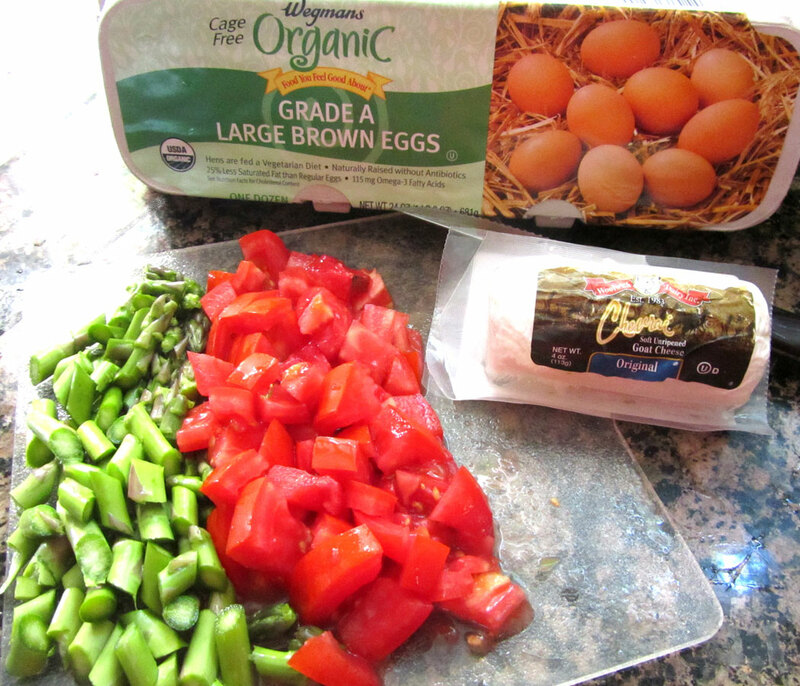 Eggs and Omelettes. This is the easy one. Our favorite omelet is mushrooms, asparagus, spinach, and some cheese. Sometimes I’ll throw in tomatoes. Smoothies. I giggle inside a little when my son automatically reaches for the baby spinach in the fridge when making his own smoothies. Fruit-based smoothies can include spinach and carrots and, if you use blueberries, you’ll never know they’re there! Here’s a quick and easy recipe full of veggies that my husband RAVED about when I made it. (And don’t let the word “curry” scare you. It’s not spicy at all!) His exact words were “It’s so buttery!” And there’s no butter in it at all! This made enough for lunch for 2 adults. Season the chicken with salt and pepper, or seasoning blend of your choice. In a saucepan, heat the coconut oil over medium heat. Press the garlic clove into the oil. Add the chicken slices and cook until browned on each side. Add the cauliflower and carrots, and cook for 3 minutes. Add the coconut milk and red curry paste, and stir gently until well combined. Cover and let simmer for 5 minutes, stirring occasionally. Add brown rice and cook for another minute. Remove from heat and stir in spinach. Stir until just wilted. How do you incorporate veggies into your meals? Please share in the comments! 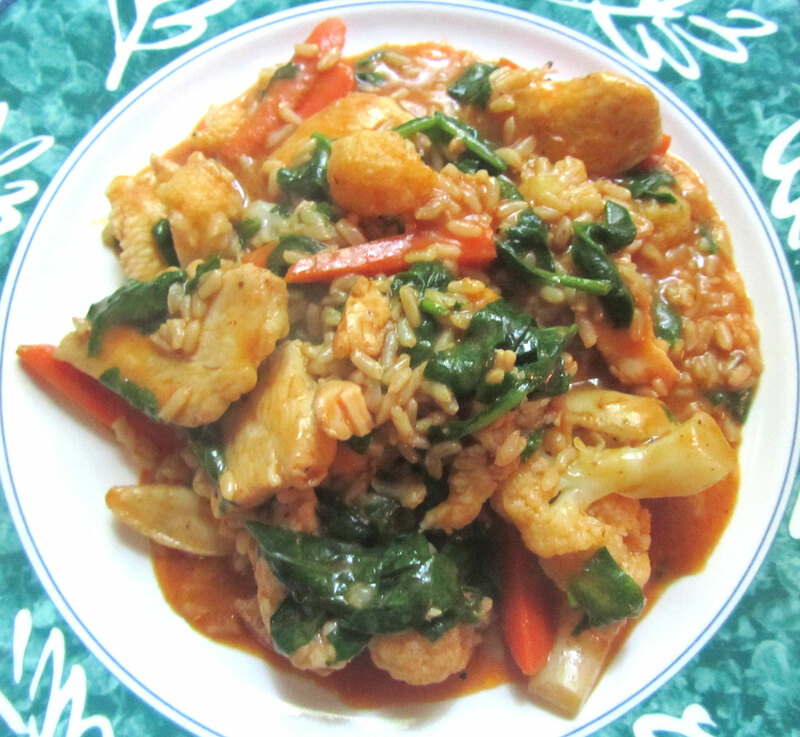 This entry was posted in chicken, Gluten Free, Refined Sugar Free, vegetables and tagged brown rice, chicken, dinner, lunch, quick and easy recipe, recipe, red curry, refined sugar free. Bookmark the permalink.